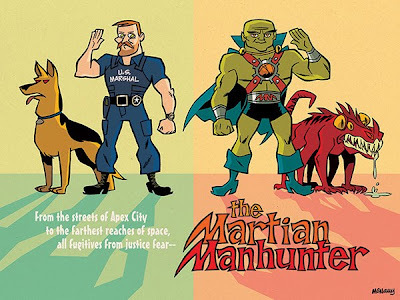 It's A Dan's World: MARTIAN MANHUNTER AND DOG? DC's looking for a way to get their often shelved characters out into the public eye? Jon McNally has just the ticket over at Project Rooftop, where his pitch for an all ages friendly Martian Manhunter, matches the heart of the Justice League with his very own telepathic, shape-changing hound. Yip, you heard right; telepathic - shape-changing - hound. It's that level of awesome. Saw this on PR. Looks like a winner to me. If I was the WB I'd have it signed up by lunch and be started on the merchandising! Thanks again for stopping by guys!